This is a car that drives itself. I don’t just mean it’s easy to drive, I mean it steers, brakes and accelerates all by itself – literally. And it’ll give you a relaxing back massage as it does so. 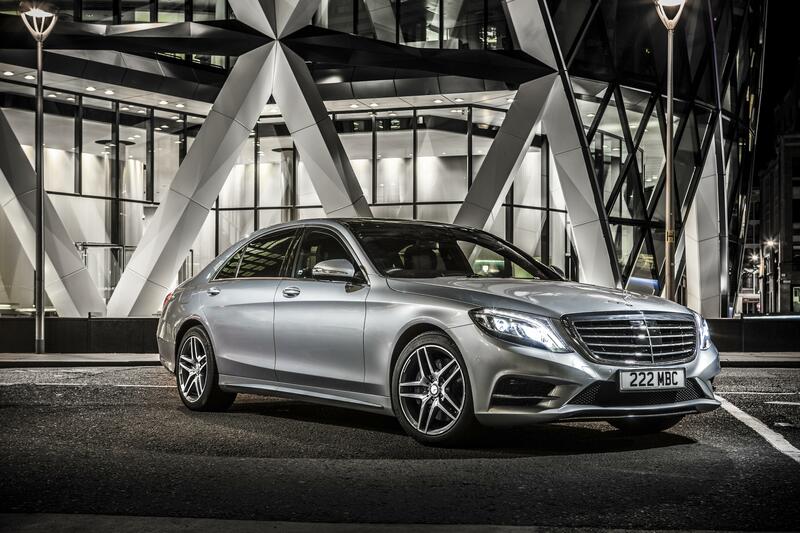 Now in its sixth generation, Mercedes-Benz has set itself the same daunting task as it has every time it has come to produce a new S-Class since 1954: To build the best car in the world. As I charge across the European continent, sensors reading the road ahead and relaying that information to the brakes and pedals, I’m rather confident they’ve succeeded. With cruise control on, the ‘Intelligent Drive’ lane-keeping assistance technology reads the lines either side and tracks vehicles and other objects that may be ahead. Should a car pull out on me, the brakes comes on. Should I take my hands off the wheel for an approaching corner, the car will steer itself. After five seconds of hands-free driving the system will make a bonging noise and switch off the assistance, a legal requirement, but the technology of the self-driving car is actually here. Not that I would ever condone such a thing, but if you want to write a text message on your phone or clean your spectacles as you’re whipping along this is probably the safest car in which to do so. 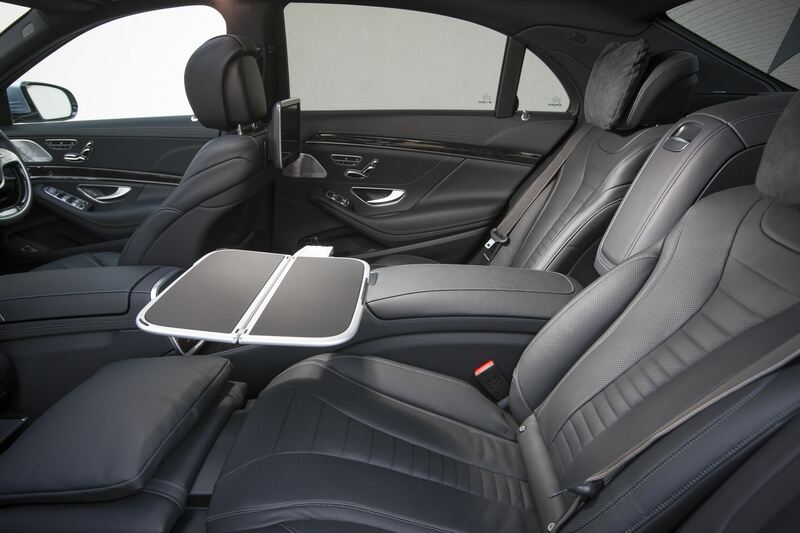 Using the COMAND (cockpit management and data) system, you can scroll though scores of options to change the settings, mood, and entertainment inside the S-Class, and one of my favourite functions is the ‘Dynamic’ seat setting, which causes the sides of these astounding leather armchairs to hug you as you go around corners. That’s just the tip of this very comfortable iceberg, for you can also specify a range of massage treatments rather like in that of a First Class airline seat. A hot stone massage? The Merc can deliver a nice approximation. Scroll further and you can perfume the interior with a range of air fresheners. Lavender seems apt. Now cue up some whale music on the 24-speaker Burmester surround sound audio system and what you have yourself is a mobile spa. The company’s luxury flagship has famously been the first car to usher many world-first technologies in its 40-year existence, including anti-lock brakes, satellite navigation and airbags, all of which have become standard across every segment. How soon will we see steering assistance and dynamic seats on the A-Class? Not long, is my wager. And there’s more. 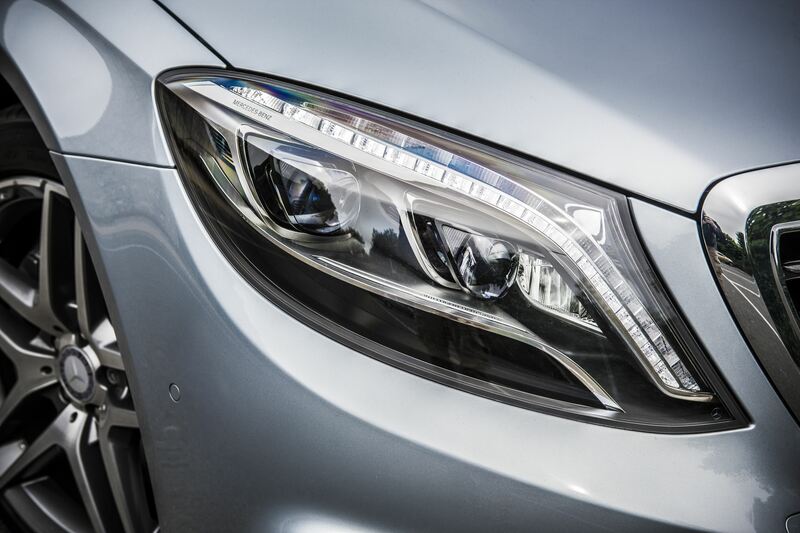 This S-Class is the first car to ditch light bulbs completely. It uses 56 LEDs in the headlights, 35 in the taillights, and 300 of them in the interior – the nattiest of which run under the dashboard and rear bulkhead as strips of coloured ambient light. You can select the glow of six different colours. I went with purple in my silver S400 with black leather and poplar wood fascia, which seemed to turn the car into a nightclub after dark. In the back, in the long wheelbase model tested, your VIP passengers have enough room to stretch out almost fully thanks to rear seats which recline 43.5 degrees. The headrest pillow is as comfortable as being cosseted to sleep upon Kim Kardashian’s cleavage. If you can stay awake, rear passengers have a TV screen each, set upon the seat in front, with functions for entertainment and web browsing. It’s navigable via a handheld remote, but a touch-screen interface would have been much easier to use. There are two pairs of very expensive-looking high-design headphones located in the door bins so the backseat drivers can watch different movies and never have to speak to each other. It’s funny to think this is only the sixth itineration of the S-Class in 40 years when every other model seems to go through an evolution in the time it takes the Olympics to come back around. Each time a new model is introduced, though, it represents a revolution. Everything is new, inside and out. Each design climbs several rungs on the evolutionary ladder. The fifth generation car (known as W221 inside Stuttgart) lasted from 2005 through to 2013, so a relatively short life. I think the design was a long way off dating. I think a big Mercedes should look boxy and imposing. It demands a presence that says ‘get out of the way’. The W221 had that in spades. It was actually a little shorter and thinner than the new model, the W222. You would never think it to look at them. The latest S-Class disguises its bulk thanks to a swooping roofline and two strong converging character lines that cut into the flanks to give the car the illusion that it’s been to the gym. The slipperier shape helps to keep road-noise to near imperceptible levels, aided further by thicker glass and door seals. It’s not as quiet as the Rolls Royce Phantom, but it’s at least equal to the Bentley Flying Spur and a step forward on its countrymen – BMW and Audi. The body uses a lot of aluminium to pare its weight below the W221’s, too. All of the above helps with fuel economy, and we’ll dig more into that in a moment. Despite these many improvements though, and the fact that this is a perfectly handsome car, I worry that it’s too discrete and polite-looking. The latest C-Class was unveiled shortly after the S last year and the pair are so similar-looking you almost need to get out a tape measure to see the difference. That’s great for C-Class owners who one day aspire to own the daddy, but if you’ve got the S you don’t want any debate as to whether your car should be given the prime parking spot outside the Four Seasons. There’s nothing retro about the exterior, but inside there’s an interesting blend of past and future. In addition to the broad swathe of poplar that could have been lifted off a Riva yacht, the two-spoke steering wheel is a 1950s flashback, evoking the big Mercedes ‘Ponton’ and ‘Fintail’ luxury saloons that were this car’s ancestors. Pulling you back into 2014 rather jarringly are two enormous digital screens, each 31cm long – one for the speedo, rev counter, trip counter and night vision display (yes, you read that right), the other for sat-nav and infoentertainment. As you’d expect, the S400 comes with plenty of additional safety kit, including eight airbags, a traffic sign recognition camera, a driver drowsiness monitor, blind spot monitoring, and a stability control system which incorporates Curve Dynamic Assist and Crosswind Assist. Night vision, once the reserve of the Navy SEALs and Paris Hilton’s boudoir, allows you to pick up things that perhaps the LED headlamps don’t, and is most effective when keeping an eye on both. There’s also a system that predicts accidents so it can close the windows and tighten your seltbelt before impact, while another automatically applies the brakes if it senses an imminent low-speed collision with another car or a pedestrian. The S400’s cleverness continues under the bonnet, where a very small but nonetheless effective 27bhp electric motor aids acceleration and boosts fuel economy, particularly in the city where so many S-Classes crawl around in traffic. 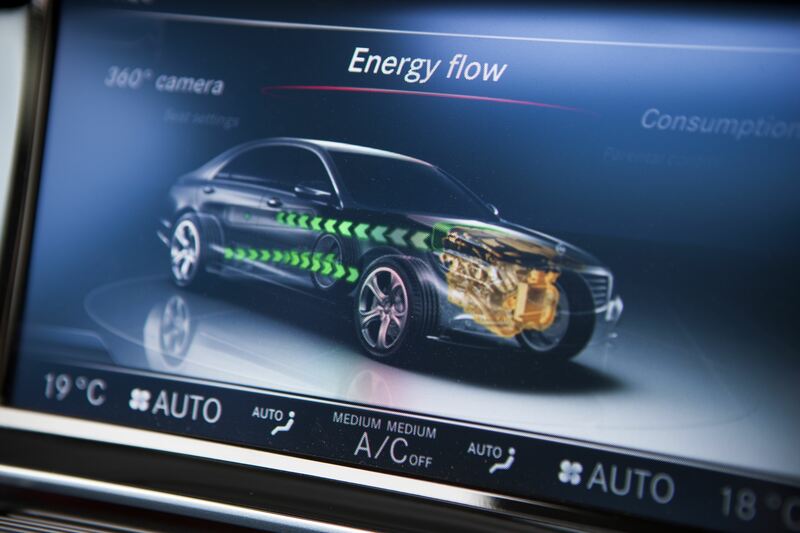 The hybrid battery is charged by harvesting energy under braking, like a modern Formula One car. When driving under electric power alone, which it can do for a mile or two (the petrol V6 usually licks in again at about 20km/h), the car is silent, but most of the time the two power sources combine seamlessly. What does that mean for your wallet? It’s enough to make me a fully-fledged hybrid convert. Combined fuel economy, Merc claims, is 44.8mpg, although the S400 Hybrid’s urban figure of 42.8mpg is perhaps more impressive. The Audi A8 Hybrid just shades it (44.8mpg), but it’s just not as capable or desirable as the S-Class. Driving a car in the real world, particularly if you suffer from a lead foot like I tend to do, usually relegates these claimed figures to fantasy, but I was left mightily impressed nonetheless. In my first 24 hours with the car, I drove over 820km from London to nearly the centre of France on a single tank of fuel. During the week I had the car, we did 2,400km together and my average consumption – across a mixture of urban roads, highway, and a bit of b-road bombing in Sport mode – came to 30.7mpg. Weighing in unladen at 2,050kg, that is mighty. 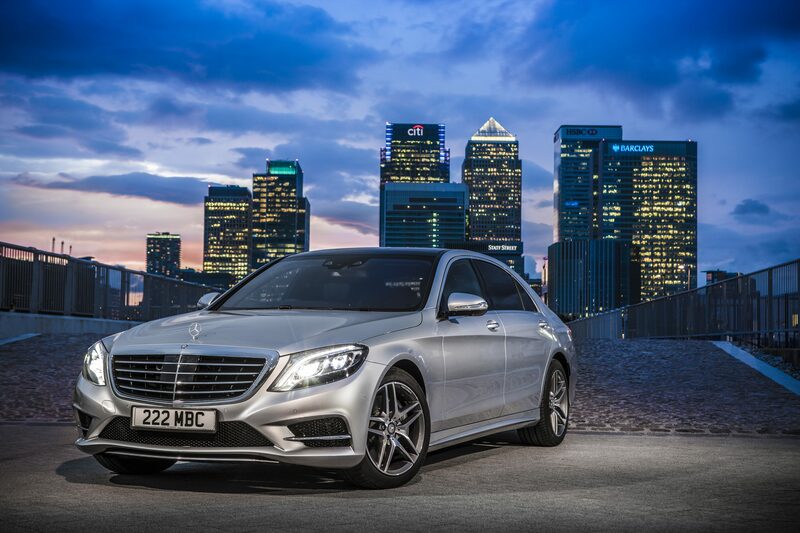 The ride befits the best-selling luxury car in the world. It isn’t quite the Rolls-Royce Phantom, but the Englander is uncompromised when it comes to magic carpet feel, while the S400’s broader remit requires a bit more sportiness. However, had my car been fitted with the optional Magic Body Control system – frustratingly only available on V8 derivatives – maybe it would beat the Rolls. MBC uses a pair of cameras atop the windscreen to read the road up to 15m ahead and pick out undulations, pot holes and speed bumps and set the suspension and damping accordingly. Amazing. At high speed the car enjoys immense directional stability, so you can drive the autobahns on which it was born with total confidence. Faced with a twisting course begging for sporty handling, though, you will discover the Merc has little feedback through the steering. The chassis is utterly composed but doesn’t egg you on. Without doubt, the Jaguar XJ and Maserati Quattroporte are much more rewarding to drive, but neither cruise anywhere near as well. Technologically, compared with the digital Merc, they are analogue. Considering the innovations at one’s disposal, I think £70,000 for the S400 is a steal. Now that Mercedes/Daimler’s Maybach brand is defunct, despite the loyal patronage of Jay Z, the S-Class has a lot of ground to cover. It needs to be priced, powered and outfitted to carry mid-level executives to and from the airport, and it also needs to indulge the most demanding customers who expect perfection in every way. Is it the best car in the world? Probably. It sets a new benchmark, that’s for sure. It is the cleverest car I have ever driven.